Use leftover pork from Day 3. Put the cabbage in a colander over the sink and toss with 1/2 tsp. of the salt. Let sit for 10 minutes. Transfer to a baking sheet lined with paper towels and pat dry. In a small bowl, mix the 2 Tbs. hoisin sauce with the soy sauce, sesame oil, and vinegar. Set aside. In a 12-inch heavy-duty nonstick skillet, heat 1 Tbs. of the oil over medium-high heat until shimmering. Add the pork, sprinkle lightly with salt and cook, stirring, until it starts to brown around the edges, about 3 minutes. Transfer to a large plate. Add 1 Tbs. of the remaining oil to the pan and once it’s shimmering, add the scallion whites and the mushrooms, sprinkle with the remaining 1/4 tsp. salt, and cook, stirring occasionally, until they brown and soften, 2 to 3 minutes. Push the mushroom mixture to one side of the pan and add the eggs. Cook, scrambling and breaking up with a wooden spoon or spatula into small pieces, until just set, about 1 minute. Transfer the contents of the skillet to the plate with the pork. Add the remaining 1 Tbs. oil, and once it’s hot, add the scallion greens, cabbage, ginger, and garlic. Cook, stirring occasionally, until softened, about 2 minutes. Add the reserved hoisin mixture and the pork mixture to the cabbage and stir to distribute the hoisin. Cook, stirring occasionally, for 1 minute to meld the flavors. Serve family style: Tell diners to spread about 1 Tbs. 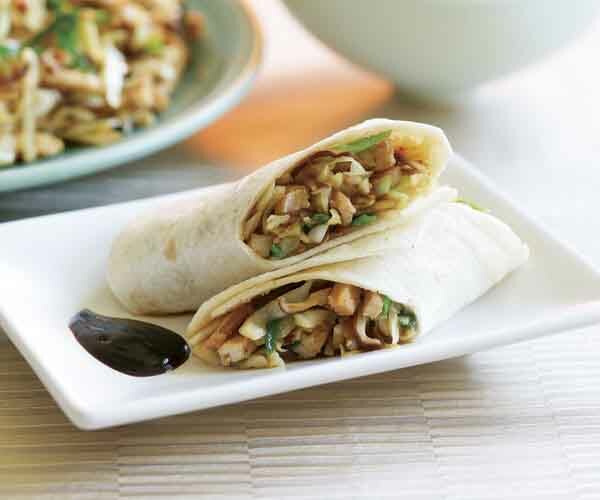 of the hoisin down the center of a tortilla, arrange a generous amount of the pork mixture over the hoisin, and wrap in the tortilla, burrito-style.